Ride with GPS: making it easy, safe, and fun for cyclists to go on great rides worldwide. One press and you're off riding. Start recording your ride on the Ride with GPS app with just a single tap. 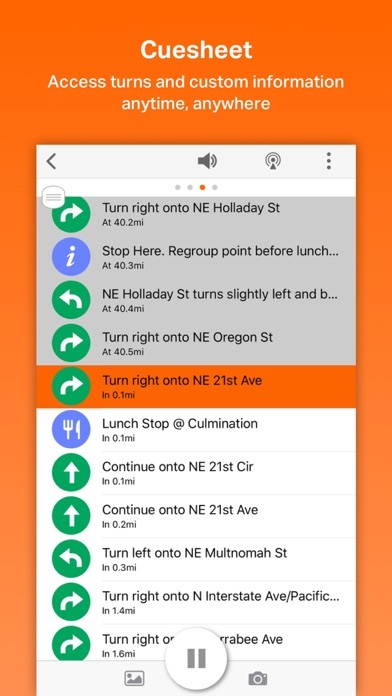 Get spoken turn-by-turn directions for your routes using our signature voice navigation feature. No data? No problem! Anyone can record rides without a data connection. Basic and Premium subscribers can even download routes to their phones and navigate while offline. Get detailed elevation data Interact with your rides and routes right in the app. Use the elevation profile to check out climbs and descents. Zoom in, pan, and see exactly where on your map that big climb starts. Share your rides in real time Use our Live Logging feature to share your rides with friends and family in real time. 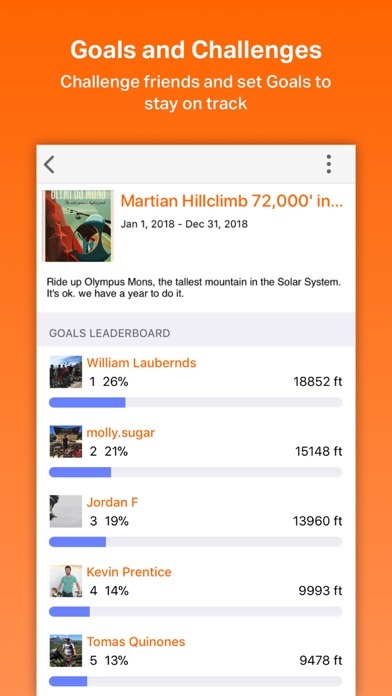 The app will even read their comments to you aloud as you pedal. 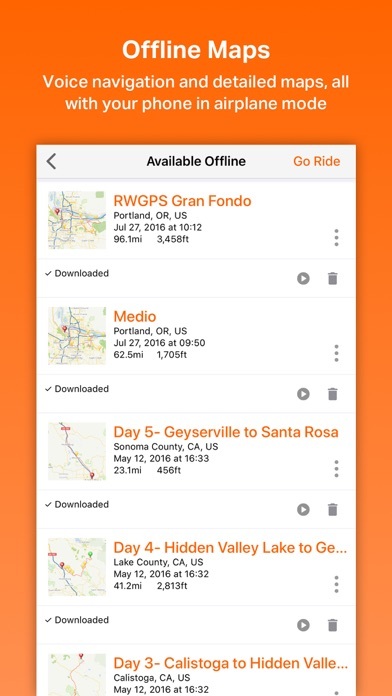 Access your club, event, or tour routes If you're a member of a Ride with GPS club account, or are participating in an event or tour that is run by a Ride with GPS organization account, you can access your routes directly from the Ride with GPS app. Cue sheets and POIs See your route cue sheet and all points of interest (POI) on the app. 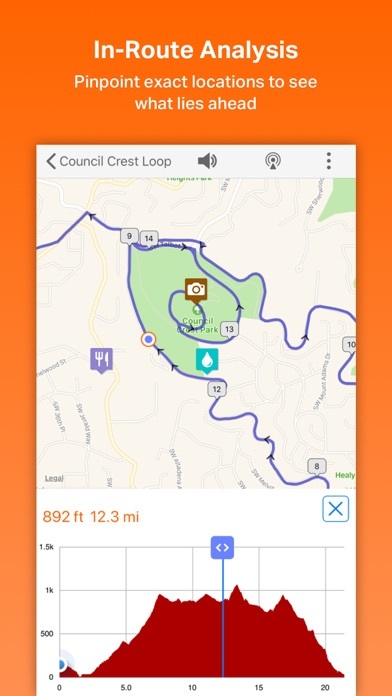 Add POI from the app while riding - great for scouting new routes, noting features like water stops or amenities, or anything else you want to remember once the ride is done. Photo GPS integration The Ride with GPS app saves location data for photos taken while recording rides. When you upload your ride and photos, you’ll see where each picture was taken. Bluetooth devices Ride with GPS supports all sensors equipped with Bluetooth Smart (Bluetooth 4/BTE/BTLE) connectivity. Connect your heart rate monitor, power meter, cadence sensor, or other devices to record metrics while you record your ride. Segment matching See how you stack up against other riders, or just yourself, using segments. Create your own on the Ride with GPS website, or match with public segments created by other users. This app integrates with the Health app via HealthKit. Privacy You control the privacy of your rides, routes, and other content on Ride with GPS. You also control your data. We'll never hold your ride history hostage, and you can download your data from Ride with GPS at any time. This app integrates with the Health app using HealthKit. 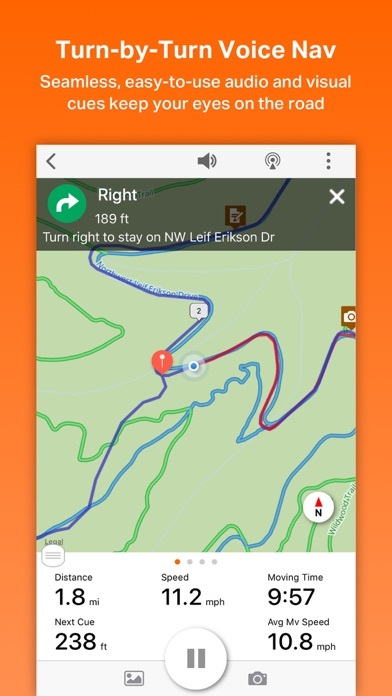 Subscriptions To unlock offline maps, voice navigation, live logging, and additional features, we offer these subscription options: • Basic ($5.99/month or $49.99/year) • Premium ($9.99/month or $79.99/year) Payment will be charged to iTunes Account at confirmation of purchase. Subscriptions renew automatically unless turned off. Account will be charged for renewal within 24-hours prior to the end of the current period. Subscription renewal will be at the same price as initial purchase. Subscriptions may be managed and auto-renewal turned off by going to your iTunes Subscription Settings after purchase. Cancellation of subscription will take effect on your next renewal date. Service Terms: https://ridewithgps.com/terms Privacy Terms: http://ridewithgps.com/privacy DISCLAIMER: Continued use of GPS running in the background can dramatically decrease battery life. Such a high monthly recurring fee isn’t worth the occasional time I’d like to use this app. This was the app of choice for a ride/race I was doing. I reluctantly downloaded the app (I was already using garmin and strava successfully), but it wouldn’t scan the QR code provided for the race route, it kept saying it was unreadable. I tried all the various codes provided for the different length rides that weekend and none of them were readable by the app. I couldn’t reach customer support by phone so sent an email to get a refund, at that point riding without a cue sheet. 6 months later I realized I was still being charged monthly, but the subscription fee is charged through iTunes, and not disclosed as an app fee. I thought it was my monthly iCloud subscription. When I contacted customer support, I was told that not only was a refund not an option, but they couldn’t unsubscribe me. I’d have to wade through my phone settings to donut myself. I hadn’t logged in to the app in six months. Their directions to unsubscribe were succinct and the rep was polite, but this App was a huge waste of money. They chose iTunes as their payment vendor when other more transparent and user-friendly options exist, (PayPal, Venmo) and then used the iTunes interface be an excuse for their inability to handle my account. The app was cumbersome and didn’t work from the get go. Not impressed. I had a basic subscription and there was no way to upgrade. So I let it expire. Now since it’s a past subscription, the iPhone App Store still will only show options to renew the basic subscription. Truly a losing business model! Couldn’t create an account with my own email address and password. Had to wrestle with it to prevent the keyboard from covering up the Facebook sign up option. Once I finally got into the app., I couldn’t save or share a route. Overall, a frustrating and clunky experience. Needs a lot of improvement. Update: Support contacted me and gave directions to show cadence. Kudos for contacting me in a timely manner and giving a resolution. Original post: Can’t see what my cadence is on the app while riding. I’d give this 5 stars if it was added. If it is there please tell me how to see it. If you are trying to import KML layers it wont give you turn by turn directions. I spent $4 for the trial version to realize it doesnt work, waste of money. The ultra cycling event uses this app. I got the app. I even purchased the app which I did not want to but had to to use for the event. Then I’m still not able to access all of the features until I upgrade again. Then the app wants access to my photos. Subscription cancelled already. Keep coming back to this app. Syncs seamlessly to my Wahoo Elemnt. Great directions. Whenever I’m somewhere new and need to work out a ride, or whenever I get bored with Strava’s incessant need to introduce me to people I’ve said NO to before I end up back here. Happy to pay the price for great mapping, turn by turn directions, segments that work for me, and the ability to invite the friends I want to invite. Stats are well thought out too. Worth the money. It would be nice to have Apple Watch support and the ability to create routes on my phone.